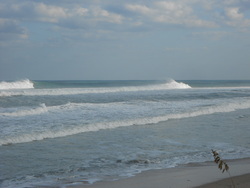 Boynton Beach in South Florida is a reasonably exposed beach and reef break that has quite reliable surf and can work at any time of the year. Offshore winds blow from the west. 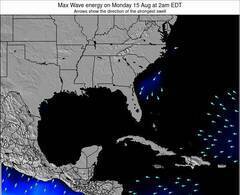 Waves just as likely from local windswells as from distant groundswells and the ideal swell direction is from the northeast. The beach breaks offer lefts and rights and in addition, both left and right reef breaks add variety.. Good surf at all stages of the tide. Rarely crowded here. Take care of rips and sharks. For Ocean Ridge, ICWW, Florida, 1 km from Boynton Beach. At Boynton Beach, 4 km from Boynton Beach. At Fort Pierce, FL, 72 miles from Boynton Beach. The two graphs above are also combined in the single Boynton Beach surf consistency graph. 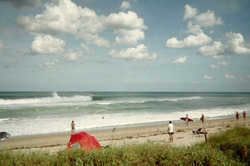 Also see Boynton Beach surf quality by season and Boynton Beach surf quality by month. 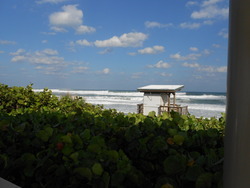 Compare Boynton Beach with another surf break. The closest passenger airport to Boynton Beach is Palm Beach Co Park (West Palm Beach) Airport (LNA) in USA, 9 km (6 miles) away (directly). The second nearest airport to Boynton Beach is Boca Raton Airport (BCT), also in USA, 17 km (11 miles) away. Third is Palm Beach International (West Palm Beach) Airport (PBI) in USA, 19 km (12 miles) away. Fort Lauderdale Executive Airport (FXE) in USA is 38 km (24 miles) away. Fort Lauderdale Hollywood International Airport (FLL), also in USA is the fifth nearest airport to Boynton Beach and is 50 km (31 miles) away. Esta é a página de Surf-Forecast para Boynton Beach, Florida - South. Use a aba navegação acima para ver temperatura do mar em Boynton Beach, fotografias de Boynton Beach, previsões detalhadas do swell em Boynton Beach, previsões do vento e do tempo, webcams em Boynton Beach , vento atual em Florida - South com base em dados ao vivo fornecidos por estações de meteorologia e previsões da maré em Boynton Beach. O link para os mapas do swell em United States abrirá uma imagem ampliada monstrando United States e os mares próximos. Estes mapas do swell podem ser animados para mostrar diferentes componentes do swell, energia das ondas, período das ondas, altura das ondas, assim como previsões do vento e do tempo, observações em tempo real do estado do tempo e do mar graças às bóias de United States, navios passantes e estações de meteorologia presentes na costa. Cada uma das páginas de previsão para este surf break apresenta as ferramentas do buscador global e regional para localizar as melores condições de surf na área ao redor de Boynton Beach.